A fundamental problem of public sector governance relates to the very way of thinking it reflects; where organization is thought of as a ‘thing’, a system designed to deliver what its designers choose. 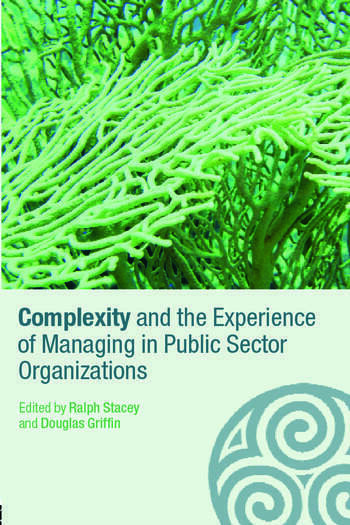 This volume questions that way of thinking and takes a perspective in which organizations are complex responsive processes of relating between people. Bringing together the work of participants on the Doctor of Management program at Hertfordshire University, this book focuses on the move to marketization and managerialism, paying particular attention to human relationships and group dynamics. The contributors provide narrative accounts of their work addressing questions of management, pressures, accountability, responsiveness and traditional systems perspectives. In considering such questions in terms of their daily experience, they explore how the perspective of complex responsive processes assists them in making sense of experience and developing practice. Including an editors’ commentary which introduces and contextualizes these experiences as well as drawing out key themes for further research, this book will be of value to academics, students and practitioners looking for reflective accounts of real life experiences rather than further prescriptions of what organizational life ought to be. Ralph Stacey is director of the Complexity and management Centre at the Business School of the University of Hertfordshire and director of the Doctor of Management programme run by the Centre. He is one of the editors of the "Complexity and Emergence" series, and the editor of two books in this series. Professor Douglas Griffin is an associate director of the Complexity and management Centre at the Business School of the University of Hertfordshire and a supervisor on the Doctor of Management programme run by the Centre. He is also an independent consultant. He is one of the editors of the "Complexity and Emergence" series, and the editor of two books in this series.